Cons: - MOBO died in 2 months after 1 month of repeated bsods. All returned mainboards have been replaced with another (can be verified by serial number) and fully tested to assure working before shipped. Please trouble shoot the mainboard with known good components. •	Unplug the ATX power, remove all components from mainboard. •	Remove the mainboard from chassis, place it on mainboard’s box. •	Reseat the CPU and heatsink fan. •	Test with single memory module. •	Test with onboard video. •	Plug the 24 + 4 pins ATX power. •	Connect the chassis power switch to mainboard, and try again. If you have any technical Support inquiry, please contact us at http://www.ASRock.com/Support/tsd.asp. We will assist you shortly. Pros: Solid motherboard with about as many features as you can get in this price range with these older chipsets. Having the USB3.0 is a bonus, as well as having an upgrade path to 95W AM3+ FX CPU's if I choose to do so later. The FX-8320E would be a nice upgrade. I like the expansion slot layout with the PCIe x1 slot above the PCIe x16 slot, and a PCI slot further down the motherboard, allows the use of both a wifi-ac PCIe card and a legacy PCI card while not interfering with a double-slot graphics card. Cons: It has been said before, and I will agree: the lack of an onboard USB3.0 internal header for case-mounted USB3.0 connectivity is disappointing. Not a deal-breaker though. I bought an Appevia CTUSB32 adapter allowing me to use one of the onboard USB2.0 headers for front case-mounted USB3.0 ports as USB2.0 only. It's better than having them unusable. Would have been nice to have another fan header or two, but in this price range that would be a bonus. Other Thoughts: I had an older Phenom II X4 945 95W CPU laying around unused, and decided to build a system around it and this motherboard was seemingly the best I could find with onboard USB3.0, albeit only at back-panel are the USB3.0 ports functional. Pros: None that stand out. Other Thoughts: I'm really upset that this isn't the right MOBO for me, if I could go back in time, i'd get a different one, I would like to return it, but that's not possible because I need to send it back, and I use my PC for school, so I can't be without a functioning PC. Mainboard has 2 x USB 3.0 ports at rear I/O and 2 x Fan headers (CPU and chassis). For more information about mainboard, please visit the specification link at below. For fan headers location, please visit user manual under page 12 (mainboard layout) at link below. Pros: So far so good. Cons: See previous review titled 'Ouch'. Other Thoughts: This is an update to my previous review, since apparently we can't edit submitted reviews (???). I misdiagnosed the issue as a faulty motherboard, when in fact the power switch wiring had somehow gotten shorted out during assembly. This was causing the unit to power up by itself, and then power off 3 seconds later. After re-soldering the power switch I was back in business. In response to ASRock's note on my previous review regarding the use of the FX8320 CPU: I haven't had any issues with it, even though you mentioned a 95W TDP limit. I I have not made any attempts to overclock it yet, but it is stable at stock frequencies. I'm rating this a 5 in part to offset the undeserved 1 which I was unable to change in the previous review. Apologies for the confusion. Pros: Works great for the price. Has USB 3.0 and SATA 3, plus on board graphics for those without a CPU/GPU combo chip. Supports a lot of AMD chips and even has two PS/2 connectors for those using a PS/2 KVM switch. Cons: Wish it had on board USB 3.0 and four memory slots, though these types of boards are built to be budget type systems. 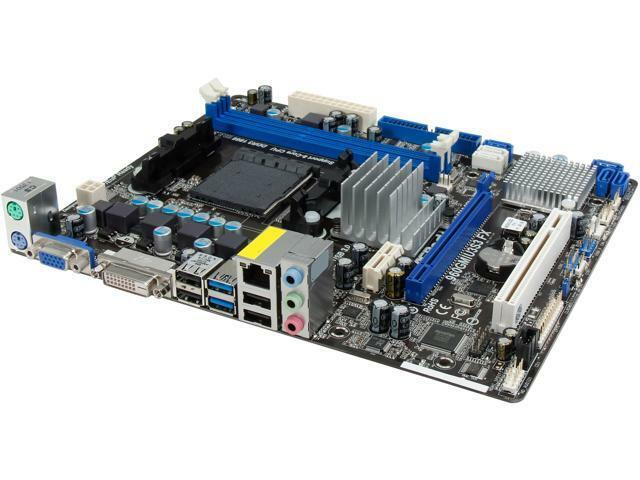 Other Thoughts: Overall a good motherboard for the price. It has some nice utilities that it comes with that let you cache disk and network data. Pros: I wanted a budget gaming PC, so I got this with an FX-8320e, 16gb RAM, and a R7 265 graphics card. It all seems to work. I like the splash screen that tells you all the keyboard shortcuts for the BIOS and boot menu and everything. The BIOS has a bunch of overclocking options, but I will be using everything at stock speeds. Cons: I had an awful time installing Windows 7. It kept complaining about not having a CD/DVD driver. I had a normal Lite-on DVD burner and I don't think that was the problem - I suspect it was the AMD sata controller. I tried giving it the AMD sata drivers, but it said they were wrong. I ended up installing Windows 7 from a USB stick. I subtract an egg out of pure frustration. Other Thoughts: I did a bit of research trying to figure out what was wrong, and it looks like I'm not the only one having problems with AMD sata drivers during Windows installation. IMO they should get their ducks in a row and make sure all their stuff is compatible with windows from the get go. Pros: This is good for a cheap compute node: a $50 motherboard with 1G network and a DVI video out supporting 16G ram or so - this is a convenient solution. The AM3+ socket and thus 8xxx CPUs are pretty dirt-cheap, so you can get 8 4GHz cores with 16G memory for about $200+$150, put it on this $50 motherboard, then buy a $50 power supply and you're almost at the sweet spot for about $450. Cons: I assumed this would come with the am3+ backplate, so I also bought an arctic freeze cooler for $25 but was unable to put it on. The cpu fan mount would work for the stock cpu fan, but those can be kind of loud, so if you are like me and you pay a bit for a cool and quiet cpu, buy a backplate to mount it on. Pros: Inexpensive board, built for comfort, not for speed. Cons: Wish it had USB3 internal connection but what do you want for $50? Other Thoughts: Don't forget to disable the onboard graphics if you are using a PCI Express card.